Zuo Modern brought the virtual reality world into its real-world showroom at the recent October High Point Market. HIGH POINT – Zuo Modern brought the virtual reality world into its real-world showroom at the recent October High Point Market. To do so, the contemporary furniture resource teamed up with House Tipster, a home-improvement website, to create a customized VR presentation of virtual rooms, using Zou’s 3D product models, which launched last January, in what the company called its Zuo 360 experience. To experience a virtual room in Zuo’s showroom, visitors had to step up to a small “stage” and put on a set of VR goggles, which were suspended from the ceiling. From there, users could view a variety of Zuo virtual rooms that changed as users “moved” around using their goggles. In front of the VR experience’s stage, others could watch what was happening on the VR goggles in real time and interact with other digital media using three touch screens. For those interested in experiencing VR again, Zuo gave out free Google Cardboard VR goggles. “Once users got accustomed to floating 15 feet off the ground and the freedom you enjoy from almost flying in a ZUO virtual room, they loved the overall experience,” said Ruesga. 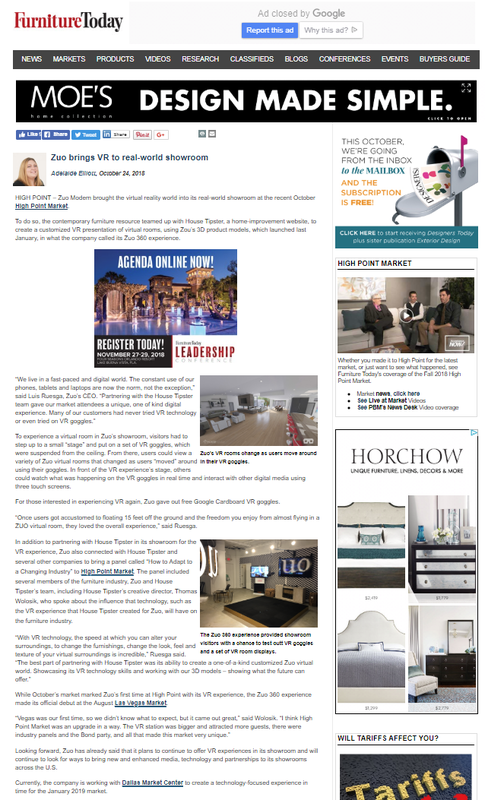 In addition to partnering with House Tipster in its showroom for the VR experience, Zuo also connected with House Tipster and several other companies to bring a panel called “How to Adapt to a Changing Industry” to High Point Market. The panel included several members of the furniture industry, Zuo and House Tipster’s team, including House Tipster’s creative director, Thomas Wolosik, who spoke about the influence that technology, such as the VR experience that House Tipster created for Zuo, will have on the furniture industry. While October’s market marked Zuo’s first time at High Point with its VR experience, the Zuo 360 experience made its official debut at the August Las Vegas Market. Looking forward, Zuo has already said that it plans to continue to offer VR experiences in its showroom and will continue to look for ways to bring new and enhanced media, technology and partnerships to its showrooms across the U.S. Currently, the company is working with Dallas Market Center to create a technology-focused experience in time for the January 2019 market.